April 2015 marks the 150th anniversary of the death of Abraham Lincoln. 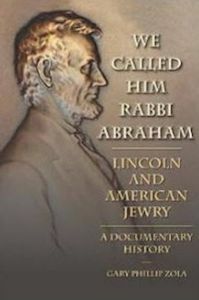 Two new and notable books tell us about the important relationships between Lincoln and the Jews. 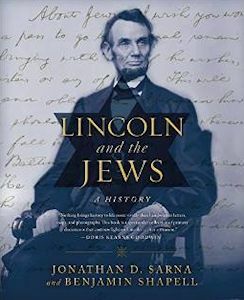 "Lincoln's lifetime coincided with the emergence of Jews on the national scene in the United States. When he was born, in 1809, scarcely 3,000 Jews lived in the entire country. By the time of his assassination in 1865, large-scale immigration, principally from central Europe, had brought that number up to more than 150,000. Many Americans, including members of Lincoln's cabinet and many of his top generals during the Civil War, were alarmed by this development and treated Jews as second-class citizens and religious outsiders. Lincoln ... exhibited precisely the opposite tendency. He also expressed a uniquely deep knowledge of the Old Testament, employing its language and concepts in some of his most important writings. He befriended Jews from a young age, promoted Jewish equality, appointed numerous Jews to public office, had Jewish advisors and supporters ... . Through his actions and his rhetoric he embraced Jews as insiders." For most of this nation - Christian Americans - Lincoln's assassination came on Good Friday, the commemoration of the day Jesus Christ died. Many Christians thought that Lincoln, like Jesus, had died for us. For many American Jews, news of Lincoln's death in the early morning of Saturday April 15, 1865 came when they were in their synagogues on the morning of the Shabbat of Passover. To hear of the death of the man who freed the slaves at this time, when the Jewish people were celebrating their own freedom from slavery, was shattering. We read accounts of rabbis who broke down in tears announcing the terrible news to their congregants, comparing the late president to Moses. 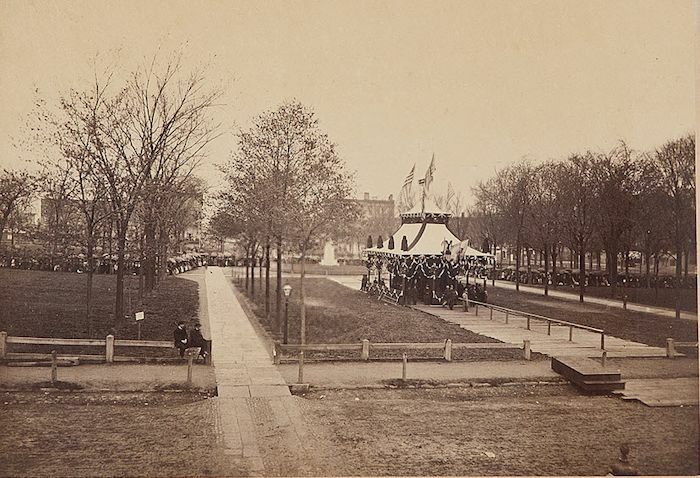 After lying in state for three days Lincoln's coffin and the just exhumed coffin of his third son William, who had died in 1862 and would be re-buried in Springfield next to his father, were placed on a special funeral train. 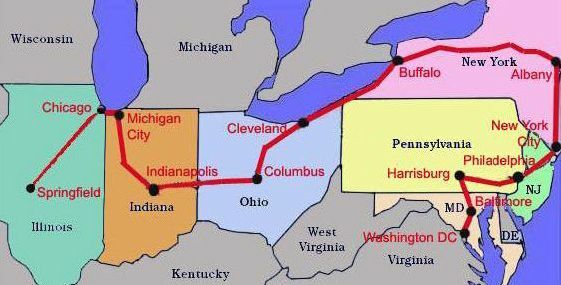 After stops in six cities it arrived at 7:00 am Friday April 29, 1865 in Cleveland,. It would depart for Columbus at midnight. There were no Jewish newspapers in Cleveland to record Jewish reactions to his death and participation in the funeral observance, but we know of two instances. Robert Dauby Gries, in his recently published story of his family, tells of Simpson Thorman, as a city council member (the first Jewish member of council, it should be noted), being included in a civic honor guard. The Plain Dealer describes the inclusion of the International Order of B'nai B'rith in the procession. People came from far and wide. Estimates of participation range up to 100,000, at a time when the city's population was about 65,000. In 1865 there were several Cleveland newspapers, but only the Plain Dealer's archives are online. Presented below are some clippings and links to its coverage of that visit. A Democratic newspaper, the Plain Dealer opposed Lincoln's election and re-election, but no suggestion of that can be found in its reporting of his death and funeral. Abraham Lincoln never visited Cleveland as president. As president-elect, he did stop briefly en route from Springfield Illinois to Washington DC for his inauguration. His funeral train followed a similar route, but westward. On board were a few relatives, a military honor guard, many dignitaries, and representatives of every state in the Union. Stops with ceremonies (Cleveland's was a full day) were held in the cities shown in red. The train's detailed schedule was published. Americans - some say millions of them - stood at stations and along the tracks day and night to pay their respects to the fallen president. The funeral procession was organized into six divisions, each with an assistant marshal. The April 27, 1865 Plain Dealer story of organizations participating in the parade shows the I.O.B.B. (International Order of B'nai B'rith) in the fifth division, incorrectly listed as the I.O.O.B. Society. Each division would assemble on a different street. Bands were brought to Cleveland so each division would have one. Mayor George Senter's proclamation asked that restaurants be open to accommodate the many visitors, but all other businesses to close, that buildings along the parade route be draped in black, that no alcohol or ale be served, and that decorum be observed throughout the day. 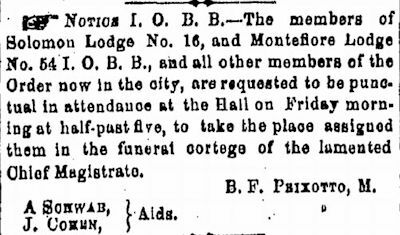 This notice in the Wednesday April 27, 1865 Plain Dealer informed members of the International Order of B'nai B'rith of their participation. They were to assemble at 5:30 am in the hall, whose location at this time is not known. Solomon Lodge had been founded in 1853, Montefiore Lodge in 1864. Where did Jews live then? Many lived near the Haymarket, today the Gateway area. Tifereth Israel was at East Sixth and Huron, Anshe Chesed on Eagle Street, west of East Ninth. In a trend that continues today, some early settlers had moved east to newly-built homes. In 1865 it was near Woodland and East 22nd; the modern conveniences included indoor plumbing. Benjamin Franklin Peixotto was the regional leader of the IOBB and would soon bring the Jewish Orphan Home to Cleveland. Alexander Schwab had been the first president of Tifereth Israel. Lincoln's open coffin lay in this pagoda-like structure on Cleveland's Public Square. Two lines of mourners would file by, all day and evening, a line on each side. tens of thousands to pay their respects to their fallen president. The Plain Dealer story on the procession written April 27, before the funeral train arrived. The Plain Dealer story written on the day of the funeral procession. April 29, 1865. CSU's Cleveland Historical page on Lincoln in Cleveland. A collection of photographs assembled by Christopher Busta-Peck.